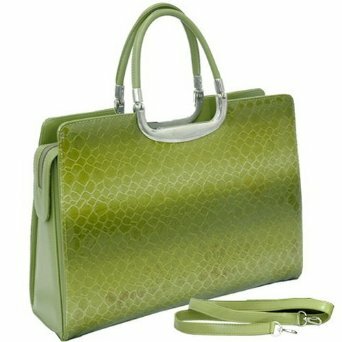 Ladies this Croco briefcase is so spacious it can carry your laptop and gives you that fashionable look that other bags lack. This chic multi-crocodile print bag fits small portable laptops 11″ wide Absolutely elegant, makes a professional impression. Satisfaction guaranteed. * Dual carrying handle with detachable shoulder strap is included. * Made of embossed and smooth textured faux leather. Absolutely elegant finish. * Top zippered opening keeps items secure and zippered back pocket. * Inside zippered pocket and cell phone pouch.